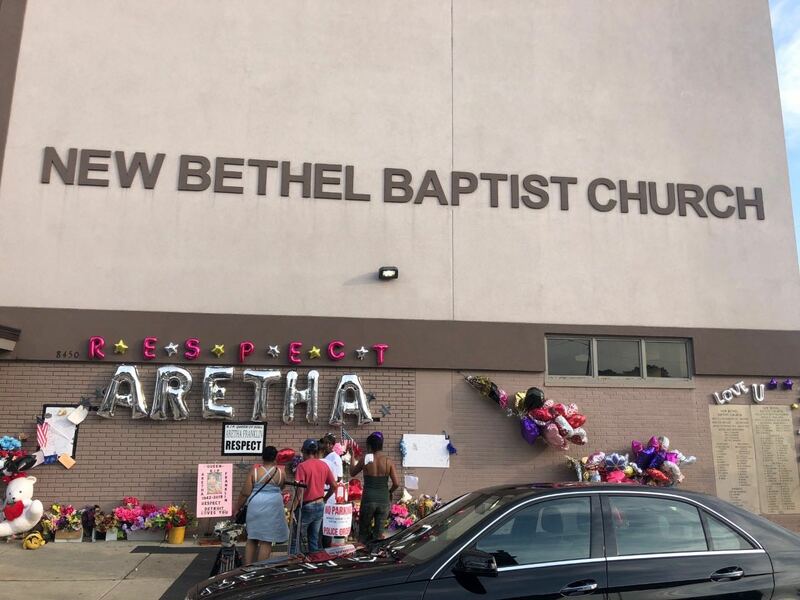 A memorial has been built outside of Aretha Franklin’s father church in Detroit. The native Detroiter and international icon passed away August 16 in her hometown after a battle with pancreatic cancer. The tribute featured some of the more notable pastors and gospel music singers in the city of Detroit, including Dorinda Clark-Cole of the Grammy Award-winning gospel group The Clark Sisters, Rev. Robert Smith Jr. of New Bethel Baptist Church, Evangelist Evelyn Turrentine-Agee, Rev. Kenneth Flowers of Greater New Mt. Moriah Baptist Church, Minister Des’Monicka Jones, the Detroit Youth Choir, and many others. In 1946, Rev. C.L. Franklin moved his family to Detroit to become pastor of New Bethel Baptist Church. Aretha Franklin’s mother died before she turned 10 and that is when Franklin began her singing career, singing solos at her father’s church in 1952. Long before No.1 hits such as “Respect” and “Chain of Fools” and a successful career in secular music, Franklin began her career as a gospel singer. She released a number of gospel songs, including “Precious Lord” in the late 1950s. Franklin was known as the Queen of Soul, but gospel music remained a constant force and source of comfort throughout her life. Franklin annually hosted gospel concerts at New Bethel Baptist, located on a stretch of Linwood Avenue in Detroit renamed in her father’s honor, and donated to its fund, never forgetting about her Detroit and gospel music roots. Terry Tarrant created the shrine outside of New Bethel Baptist Church for Franklin. He started building the memorial one hour after Franklin passed away and has watched it grow to feature a multitude of balloons, stuffed animals, posters, pictures, and a stereo blasting Franklin’s most popular songs. Tarrant has been in front of the church every day, sometimes for 8-12 hours, watching the world convene at the site where it all started for the Queen. “I created this so that Detroiters and people from all around the world can pay homage to the Queen of Soul,” said Tarrant. “It started with the posters on the end of the church and then I started planting the roses. I placed some balloons and poster boards to make it more appealing. A public viewing of Franklin will be open to the public at New Bethel Baptist Church Thursday, August 30 from 12-4 p.m. Her body will lie in state for two days at the Charles H. Wright Museum of African-American Museum History August 28-29. The viewing will run 9-9 p.m. each day. Franklin’s life and legacy will be celebrated with a free concert at Chene Park’s Amphitheatre on Thursday from 6-9 p.m. Her funeral at Greater Grace Temple on Friday will not be open to the public but will be live streamed by Local 4 beginning at 9 a.m. Expected guests include Stevie Wonder, Fantasia, former President Bill Clinton, Smokey Robinson, Rev. Jesse Jackson, music mogul Clive Davis, and a long list of other dignitaries.